Yes! We now offer Gift Cards! What amounts are available for a Gift Card purchase? You may purchase a Gift Card in any amount, from $5 up to $500. Treat your card like cash - the value of a lost or stolen card is non-refundable. Will I be able to use my Gift Card if the magnetic strip is damaged? Yes! As long as the numbers on the card are legible, we can process the card manually. You can use your Gift Card at any of our locations: Two Scoops Anoka, and at the Anoka Ice Rink (open seasonally). Can I still use my old paper Gift Certificates? Yes - we will still accept your paper Gift Certificates. There is no expiration on the paper Gift Certificates that were previously issued. Can I use my old paper Gift Certificates to buy a Gift Card? No, paper Gift Certificates may only be used to purchase Two Scoops products. No, Gift Cards may only be used to purchase Two Scoops products. Can I re-use or add more money to my Gift Card? Absolutely! Just stop in to Two Scoops Anoka to add funds to your card. 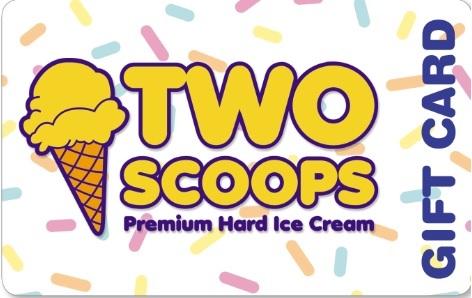 You may stop in to Two Scoops Anoka, or call us at 763-323-0622. Are there any service charges on my Gift Card? There are no service charges on your card, ever. No, your Gift Card does not expire. *Gift Card purchases are excluded from participation in discounts and other coupons offered unless specifically noted.